After the Sigma chartering ceremony, the chapter designate is now considered an official Sigma chapter. All chartering members and future inducted members will become members of Sigma and the chapter. 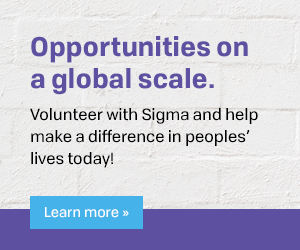 In addition to the benefits that the chapter will provide, active members are eligible for valuable Sigma resources throughout their entire nursing career. 1) Adopt and operate according to Sigma chapter bylaws. 2) Attend Charter Recognition at the next Sigma biennial convention. 3) Prepare to send 2 delegates to each Sigma biennial convention. 4) Conduct regular board meetings to plan chapter events, benefits and services. 5) Communicate chapter events, benefits and services to members. 6) Plan and hold annual inductions. 7) Maintain records of finances, events, benefits and services. 8) Plan and conduct 2 or more programs and 1 business meeting for members annually. 9) Plan future programming, events and benefits. 10) Plan future budgets to correspond with current and future event planning. 11) Report officer changes via the Officer and Committee Chair Report in the Chapter Management System. 12) Conduct chapter leader elections and host transition meetings with outgoing and incoming officers. 13) Attend recommended chapter leader trainings. 14) Complete first Sigma chapter annual report after first year of chapterhood. 15) Create or continue Policies and Procedure Manual, Strategic Plan and Leadership Succession Plan. 16) Learn about required chapter liability insurance available via Sigma. 17) Learn about chapter fee assessments and chapter disbursement checks. As a new chapter, you will now have access to the All Chapter Officers Workgroup in The Circle! The All Chapter Officers Workgroup is comprised of officers from all Sigma chapters. Its purpose is to provide chapter leaders with opportunities to network, collaborate and share resources. Staff at headquarters are available by phone or email to answer your questions about honor society andchapter development.